Last weekend my nephew Craig married a beautiful young woman named Lindsey, who we are thrilled to welcome into the Smith clan. We spent the weekend for the lovely event in Appleton, WI, her home town. 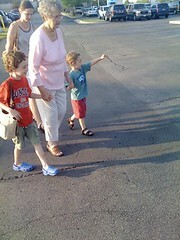 I love this picture of my mom and the boys. Please note she is walking on two brand new knees, minus the aid of walker or cane. This has been an excruciating journey for her, and we couldn't be prouder of how far she's come. Elliot had just finished asking her, "So how are your knees feeling, Grammie?" And my chivalrous husband had him carry her purse. We love you, Mom!